On 26 November 2015, the Russian Federation and the Sokhumi occupation regime concluded yet another document in the military sphere. In particular, the so-called “agreement” on the creation of the joint group of armed forces was signed. Abkhazia is an integral part of Georgia and does not represent an independent subject of the international law, therefore, any attempt to sign an “agreement” with the region is a gross violation of the international law and constitutes an illegal action devoid of legal consequences. The Georgian Foreign Ministry expresses its deep concern over the Russian Federation’s yet another provocative step, which, along with the other forms of militarisation of the occupied territories, endangers the security of Georgia and the region as a whole. Being an integral part of the “Treaty on Alliance and Strategic Partnership” signed on 24 November 2014, the aforesaid “agreement” once again demonstrates that the Russian Federation, with complete disregard for the international obligations and fundamental principles of international law, continues the policy of creeping annexation of Georgia’s occupied territories thus violating Georgia’s sovereignty and territorial integrity. Having signed this document, Russia, despite the Georgian Government's repeated calls, once again infringed the provisions of the 12 August 2008 Ceasefire Agreement that is of particular concern given the absence of international mechanisms in the occupied regions and Russia's persistent refusal to undertake the non-use of force pledge. 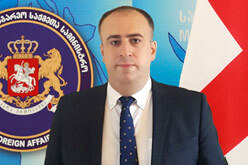 The Georgian Foreign Ministry calls on the international community to give due assessment to Russia's illegal step and to take appropriate measures in order to prevent a further escalation of the fragile security situation in the region.